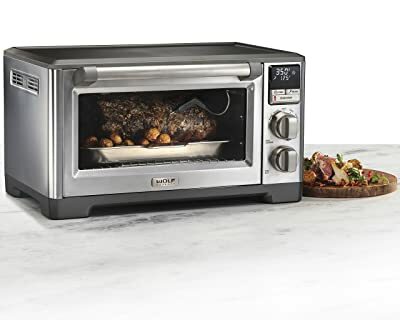 10 Best Toaster Oven Reviews 2019 - Convection Ovens are Better? 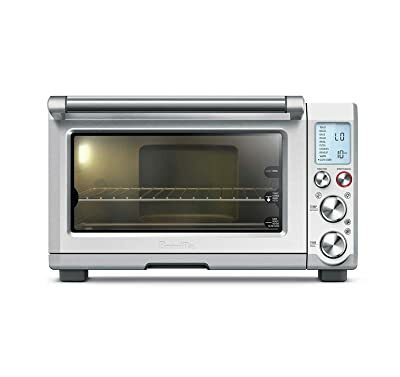 In modern times, a countertop toaster oven is a great addition to your kitchen accessories. If you want a more convenient energy saving option to your current full-sized oven, then a toaster oven is exactly what you should be looking for. Besides making your beloved toast, this cooking ware can do much more. The best toaster ovens today have surprising capabilities. You can bake cookies, roast chicken, melt cheese on sandwiches and even heat up a frozen pizza among many others. Some of their functionalities rival those of standard ovens. Despite their apparent reliability, you need to carefully consider your options when buying one. For this reason, we have prepared a comprehensive buying guide for the best toaster ovens currently available. If you are looking for one, then we have you covered. 2.2 2. What Functions Does Each Excel at? The Breville BOV800XL is one of the best toaster ovens in 2019. Its design is such that it allows for customization to meet your unique needs. The high-end design has a feature that Breville claims to be uniquely intelligent, alongside a multitude of other great features. With a total of nine preset functions, this oven easily rivals a full-sized oven. You can toast, bagel, roast, bake, broil, make cookies, pizza, warm, and reheat. These functionalities are great if you want a versatile piece of equipment that does more than just toasting. Perhaps the most unique feature is the Element IQ. It is a cooking technology which automatically adjusts power to the five heating elements. In this way, heat is evenly distributed throughout the oven based on the type of cooking method you have selected. Inside the oven is a 12” square baking pan, another 12” rack for broiling, and a 13” non-stick pizza pan. When cooking, a source of light is provided inside the oven for checking the cooking progress without opening it. Moreover, an easy to read LCD display makes operating the oven a breeze. 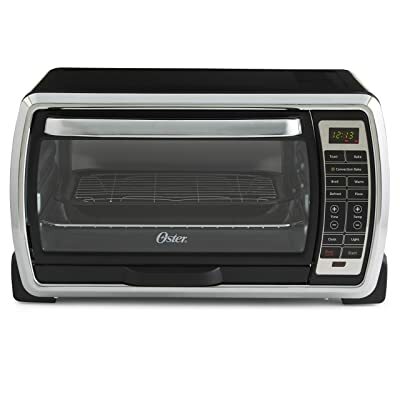 This Oster toaster oven is a great option for those on a tight budget but still would love a large sized oven. Don’t let the price fool you as it has some amazing features and is just as capable as the pricey ones. It uses a convention technology for even heat distribution. A roomy interior is a great feature for those who prepare meals for large sized families. A total of 6 toast slices can be accommodated at any one time. In addition, for those who love baking, a 13” x 9” baking pan is available for your use. A black finish on the exterior is a deviation from the stainless steel housing for those who mind such a type of housing. An oven convenience is provided for by a wide range of temperature capabilities. It can operate between 150 and 450 degrees Fahrenheit. Digital controls make operating the 6 preset functions a lot easier. There are functions for baking, broiling, toasting, defrosting, warming, and convection baking. There is an interior light so that you can easily view the cooking progress. 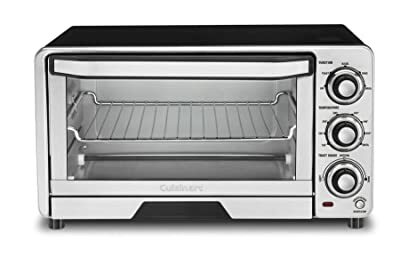 The Cuisinart TOB-40N is a toaster oven and a broiler, alongside other capabilities. 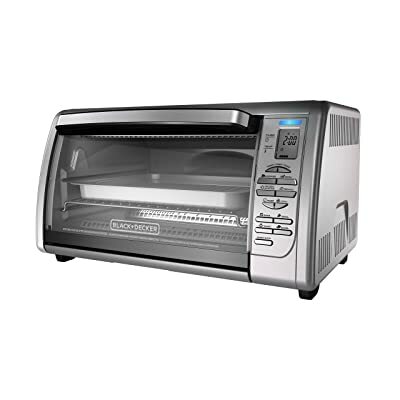 Its considerable volume, smart technology, and an array of menu options make it a great choice for your toasting needs. At the front it features controls meant to ease your work. A full-sized interior can hold up to 6 slices of toast, as well as an 11” pizza. The capacity might not be as large as the previous ones, but it’s still great for a middle-sized family. Use the toaster oven to make toast, bake, bagel, and broil. The front part is made from stainless steel for an easy to clean and non-hot surface. Dials made from rubber line the front on the right-hand side. These are kept cool and are easy to grip for an assured use. Inside the oven is a single tray for carrying out all the cooking. An auto-slide out rack conveniently allows for a hands-free loading and the easy removal of already prepared food. Once a cooking cycle is complete, the oven automatically shuts off. It’s a great feature aimed at preventing food from overcooking or overheating the element. The Panasonic NB-G110P is an impressive toaster oven with its speedy cooking ability. Its efficiency and precise browning ability is another feature we found appealing with this toaster oven. These are features useful to those who spend limited time preparing meals. For a faster cooking process, the oven requires not preheating since it becomes hot after a relatively short time. With a combination of a ceramic and quartz infrared heating elements, this toaster oven quickly cooks food as it evenly distributes the heat. A compact design with a small countertop footprint makes it a space saver on your kitchen. You might also love the door design which auto ejects the rack for safer food retrieval. However, you must note that it’s not very spacious inside to accommodate a whole chicken/large meat. 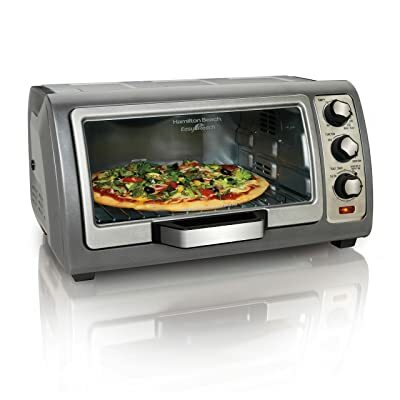 Nonetheless, it can easily toast 4 slices and heat up a 9” pizza within a short time. In a way, it is a smart toaster. It automatically calculates cooking times for the variety of foods you place in it. A digital timer is available as well as a temperature range setting of 2500F to 5000F. Adding one of the best toaster ovens to your cooking ware does not have to cost you much. Not when you can opt for the BLACK + DECKER CTO6335S. It is a great choice for those in a tight budget, while at the same time providing functionalities rivaling the best. Featuring about 8 preset cooking menus, you get an extremely versatile toaster oven without having to break a bank. Two rack positions are included into the design for an increased cooking flexibility and speed. Digital control gives you precise control over the cooking time and temperatures. In case you want to prepare a meal with a precise time control, the 120-minute variant timer gives you this ability. Once the time runs out, the toaster oven is automatically shut down. Interior compartments are sizeable too. It can accommodate 6 slices of bread and a 12” pizza. Ease of cleaning is another great feature. A removable crumb tray keeps your counter clean as you remove them with ease. The crumbs are then removed just before they burn. Otherwise, cleaning inside the toaster oven would be much harder. For those who are a little short of space in the kitchen, then the Breville BOV450XL is one of the toaster ovens for your needs. Alternatively, if you need one with no convection setting, then this could be one of the options worth considering. The smart Element IQ from Breville is fitted onto this mini toaster oven. It is an essential feature which automatically adjusts the cooking temperature while eliminating guesswork. For efficient cooking, the element IQ consists of a 4-quartz heating element with an 1800 watts power rating. Such amounts of power enable you to use the eight preset functions. These functions are toast, roast, broil, bake, bagel, pizza, reheat, and bake cookies. Because of the small size, you need to leave some clearance on top of the cooking food or else it would overheat. Limited space means only 4 slices of toast can fit inside the rack. Space is also sufficient enough to hold an 11-inch sized pizza. 3 rack positions inside the oven offer an excellent flexibility in terms of cooking alternatives. The transfer of heat through convection is one of the most efficient ways of evenly distributing heat throughout a toaster oven. Of the toaster oven out there, the Breville BOV845BSS is one of the best when it comes to utilizing this technique. Capabilities included in this oven almost match those on a conventional oven. Just like all high-end countertop ovens, it has an interior light. Such a feature may seem minor, but it’s essential when checking the progress of your meal. You don’t have to open the front door. Performance wise, the main feature is the convectional heat distribution mechanism. It is complemented by the Element IQ cooking technology synonymous with Breville toaster ovens. Together with quartz heating element, there are no cold or hot spots in the oven when cooking. A roomy space inside the oven can accommodate six slices of toast as well as a 13-inch pizza. A convection pan conveniently circulates the hot air, speeding up the cooking process. 10 preset cooking functions eliminate guesswork from your cooking. If your kids frequently make toasts, waffles or snacks in the morning or after school, then it’s important that you have an easy access toaster oven. It is an essential feature for the young ones to safely get out the hot food. The Hamilton Beach 31126 is a great choice for this purpose. One of the endearing features is the unique roll-top door. It is great when you need to easily reach your already cooked meal. The door rolls upward, unlike the traditional ones that pull towards you and then downwards. Apart from easy access, the upwards pulling door keeps itself free of cheese messes and the countertop free of stray crumbs. Regardless of the small size, it can still make 6 slices of toast, heat a family sized 12” pizza, and a 9 x 11 inches baking pan. With three capabilities: that of bake, toast, and broil, you can make a variety of meals whenever you would want to. For desserts and cakes, use the bake function, while the convection function is great for crisp, caramelized crust on baked foods. 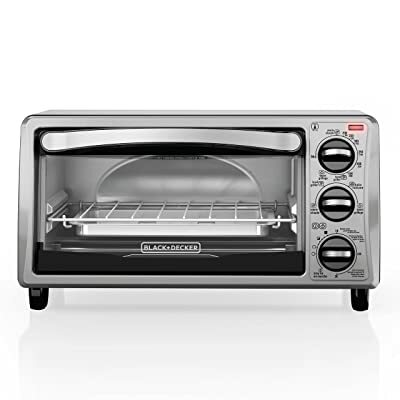 The BLACK + DECKER TO1313SBD toaster oven is probably the cheapest high-performance toaster oven you can find. With a design which matches low cost, excellent functionality and durability, this toaster oven is one that is worth considering. By using an Even toast technology; this toaster oven’s interior is designed such that it facilitates an even distribution of heat. Consequently, you can make up to 4 slices of bread at any given time. Alongside toasting, a 9” pizza can be heated inside the toaster oven. Four functions: Broil, toast, bake, and keep warm are enabled for increased versatility of the toaster. They may not be much, but for the price, it’s definitely worth it. And with a stainless steel housing, cleaning accidental messes becomes an easy task. Additional features include a 30-minute timer. This is a great feature when the precision timing is required for making a toast, warming or a stay on functionality. Breadcrumbs can be a nuisance in a toaster oven, but not when a tray is included for collecting them. If spending money on a brand new toaster oven is no problem, then the Wolf Gourmet WGCO120S is one of the great options available for you. However, the design tends towards more of a conventional oven than a toaster oven. It is kind of a 2-in-1 appliance. For the price, you get an appliance with six cooking modes. You can bake, broil, roast, toast, proof, and warm. In addition to the cooking modes, there are also three rack positions. These are great features if you need a toaster oven with excellent flexibility. An integrated probe for determining the internal temperature of meat being cooked is integral in preparing your meat to your exact preference. Plugging it into the meat is simple too as you will only be using one hand. 9 x 13-inch stoneware dishes or quarter sheet pans easily fits inside the toaster oven. Another great feature is the inclusion of a high-volume airflow convection fan. Sucking in air through the airflow vents, it evenly and thoroughly circulates the heated air for an even roast or baking. Together with 5 heating elements, food cooks faster and uniformly. If you walk into any kitchen, you are most likely to find either a microwave or a toaster oven. They have become indispensable kitchen appliances for quick and convenient cooking. However, there is an unending debate on which one is a better choice. To help you understand the two better, we will do a comparison so as to help you decide on which one would be the best fit for any specific needs. For those who use both (there are plenty), you may have realized how differently these two work. It is for these working principles that each of them excel at what they are good at. A toaster oven works by utilizing heating elements located on the top and bottom sides of the device. The numbers of heating elements vary from model to model, with high-end options having up to five of them. Heat from the elements is transferred to the food being cooked. For even cooking, a convection mechanism is used whereby a fan evenly circulates the hot air inside the toaster oven. In this way, cooking functions such as toasting, baking, and broiling can be accomplished. High-end models are capable of much more. On the other hand, a microwave uses a completely different cooking technique. In the place of heating elements, high powered electromagnetic waves are used to heat water molecules present in the food. These waves are generated by a magnetron inside the microwave. 2. What Functions Does Each Excel at? As earlier mentioned, their different working techniques make them best suited for different purposes. Each of them outperforms the other at certain tasks, although the toaster oven tends to be a better overall performer. A toaster oven excels at functions where a crispy finish is needed. Unlike the toaster oven, microwave results in a soggy and soft food instead. For toasting, crisping or browning, a toaster beats the microwave hands down. If you love your cooked chicken with crispy skin, then invest in a toaster oven. Toasting your bread in the morning is almost impossible in a microwave. Better tasting pizza or bacon can be prepared in a toaster oven unlike in a microwave. It may take longer, but the results are superior. It is this type of cooking that the microwave excels at. Because the microwaves generated heat water molecules, microwaves work better with types of food with high water contents (boiling). The quantities of food prepared at a times are also greater than that of a toaster oven. This feature is common in microwaves so that you can easily thaw and cook food. Most toasters, however, lack this feature. It is only the high-end ones with it but require more spending to afford them. This is another area a toaster oven outperforms a microwave. Lowering the temperature allows the toaster oven to keep your food warm for later use. There are certain models with this function on their menu. Most microwaves do not have this feature unless it’s one of those expensive ones. Both a toaster oven and a microwave are by nature designed to increase cooking speeds. However, saving you cooking time then spending too long washing the mess is something you shouldn’t be up to. It is in this area that a microwave wins in this debate. It is easy to clean, parts are reachable, and glass trays can be removed and cleaned. On the other hand, a toaster oven has doors, walls, crumb trays, and wire racks to wipe clean. In addition, their heating elements need frequent cleaning to remove any clogs. They are the best for maintaining energy efficiency. Microwaves require no such maintenance works. This is an important criterion that influences most of the appliances you buy. When it comes to these two, they are technically more energy saving than a full sized wall oven. 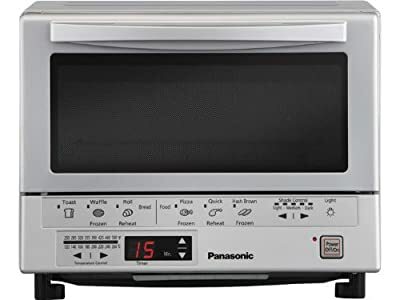 Microwaves power ratings range from about 700 to 1,300 watts. On their part, toaster ovens range from 1,200 to 1,800 watts. These power ratings do not mean that microwaves are more efficient than toaster ovens. A better evaluation would be to look for the energy star certification on the appliance you buy. We know how much time matters to you, hence the need to spend as little of it as possible in the kitchen. Between a microwave and a toaster oven, it is the former that is much faster because of its working principle. If you need to quickly reheat, prepare a meal or warm leftovers, then a microwave would be best for that. Using a toaster oven requires extreme caution since the sides tend to get very hot. The risk of suffering a burn is much higher than if using a microwave. Always wear protectives when operating one or when you have kids around. The risk of microwaves is putting in certain items that you shouldn’t. Lunch bags, Styrofoam containers or metallic-rimmed plates should be handled with care when placed in the microwave. Another concern (although it’s unwarranted) is that of radiation. You must have probably heard of stories about cancer-causing radiation from microwaves. These are untrue and lack any proof to them. Non-ionizing radiation from the microwave causes no damage to cells in our bodies. Safety mechanisms put in place ensures the waves produced remain inside at any point you turn it on. Just like any other electrical appliance, protect these from damaged cords and contact with water. The most basic toaster oven (4 slices) will cost you around $30. This price increases as the capacity increases, with a six-slice toaster oven costing around $50-$70. For specialized features, stainless steel housing and a convection cooking, the prices go upwards to around $150-$500. A 700 to 1,200 watts countertop microwave ranges from about $50 to $170. The price increases to over $360 with better features such as stainless steel housing, additional cook settings, and the capacity. As you set out to buy a new toaster oven, knowing what features to focus on makes the process a lot easier. An ideal appliance for you is heavily dependent on the provided features and how well these suit you. In coming up with the 10 products, here are the criteria we used. The toaster oven you buy should do more than just making toasts in the morning. For additional cooking, it is imperative that you give consideration to this feature. These types of toaster ovens have a fan inside them to evenly circulate the heated air inside. As a result, cooking times are shortened, hot spots are eliminated, and the food cooks evenly. Therefore, if you look to save time, then look for the convection feature. They may be slightly costlier than conventional types, but the results are well worth it. When preparing meals, the appliance size matters a lot. For a larger family, the biggest toaster oven you can find will be a great purchase. Look for one with a 13 x 9 inches baking pan, ability to fit in a whole chicken or adequate amount of casseroles and ribs. For a smaller family, something relatively small will do for you. Using a large toaster oven to prepare smaller meals leads to unnecessary wastes of energy. Always keep this in mind. Cheese, pizza, fatty food or bread can leave a bit of a mess on your toaster oven. If parts are hard to reach, then doing the cleaning can take you some time. It doesn’t have to do so in the first place. Pay special attention to stainless steel finishes, nonstick interior, and a crumb tray. These features are ideal for easy cleaning after you have finished cooking. Moreover, the accessories such as baking pans and racks should be at least dishwater safe for added convenience. A standard toaster oven will have either one or two elements for browning and toasting on the sides. However, improved models have multiple adjustable heating elements for better and faster cooking. You can in turn broil, roast, bake etc. Heating elements also differ in terms of the material used. Most of the ovens feature quartz heating elements. For a quick preheating, look for those with both ceramic and quartz infrared heating elements. The type of cooking you can do in a toaster oven is dependent on the temperature range it can accommodate. Temperature flexibility is, therefore, a useful feature to consider. If you are looking to gently toast bread and nuts or broil fish at higher temperatures then look for one that reaches 500 degrees. On a plus, the amount of adjustment is another plus feature as it determines the ability to fine tune the browning for better results. There will be no need for you to continuously specify the temperature ranges of cooking a meal. This is where cooking presets comes in handy. 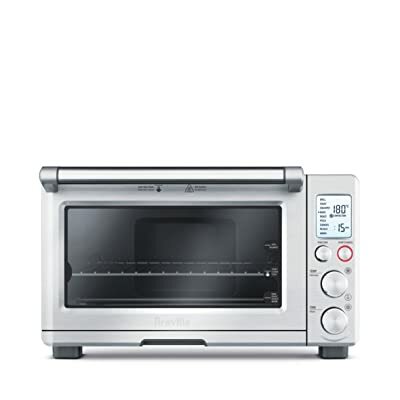 If you frequently bake, heat pizzas, broil, roast or brown, then look for a toaster oven with these presets. Sometimes having a higher number of presets may be a good idea, but not always. Some of these you might not even use. The trick is to look for the cooking functions you use most, then select the one that suits you. At this point, it is not surprising to realize that toaster ovens get foods to cook pretty fast. If you don’t watch the progress, you could easily overcook or blacken a toast. To prevent this, some models have an interior light for quick checks without having to open the toaster door. Others use a transparent glass door to achieve the same results. You need to take care of the ones with glass doors. Some glass tends to cloud up after some time. You would want to avoid these. Check for user reviews on the suitability of these glass doors. Toaster ovens heat up rather fast, posing the risk of fires and accidental burns. There should be features in place to prevent any of these from happening to you. Automatic-pop out racks once you open the door is one such feature. Other models have unique opening doors away from the operator alongside an auto-shut off the thermostat. The latter is a great one if you forget to switch off the toaster oven after use. Additionally, look for drip trays for preventing grease from flaring up. A toaster oven is a great investment for you. You definitely want it to last you for as long as possible. Let’s face it, it wouldn’t last you all that long if you commit some of the mistakes users to tend to ignore. Here are those you need to desist from. Ignoring the Crumb Tray: Here is a definite one. Keeping the toaster clean is not only for aesthetics. Breadcrumbs and grease can overheat and light up if left to accumulate in the tray. Not Following the Convection Rule: If your model has this feature, then the food will cook faster. Alongside keeping a constant eye on the food, lower the temperature by about 25 degrees. Not Unplugging the Appliance: After a decent meal, most users forget to unplug the toaster oven (who wouldn’t?). Doing this may lead to accidental switching on or shorting the toaster. Too Many Slices In: If the specification states that the toaster oven can accommodate say 6 slices, putting in only four gives better results. Skipping the Manual: We get it, all you want to do is start making toasts. However, first things first, make some time and go through the manual for a better grasp of the safety tips. Don’t just plug it in and start cooking. Sticking a Fork into the Meat While Still Plugged in: Some users do this unknowingly, but it could lead to a fatal shock in case of current/voltage leaks. Using the Wrong Dishes: There are reports of toaster ovens catching fire simply because someone used a paper towel or plastic containers to hold food while warming or cooking. That is a definite no, as long as it can ignite. You are about to make a great investment that will save you time and make you delicious meals in the process. It is essential that you carefully consider your available options so that you end up with only the best toaster oven. We hope this post has been enlightening in this regard. The products included are high quality and were informed by weeks of research and careful examination of user reviews. You can choose the ovens in this list or consider any other out of the list provided it meets your needs. 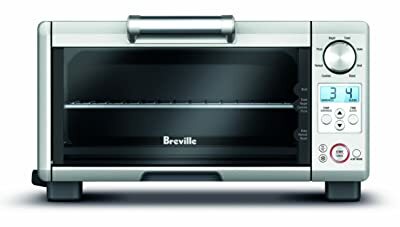 Of the ten, our top pick is the Breville BOV800XL Convection Toaster Oven. It allows for a great deal of customization with 9 preset functions. An “intelligent” Element IQ provides just the right amount of cooking power. A host of safety mechanisms keeps you from harm’s way. These features are what make it a top pick for us.